I drew a rough map in the red-orange Saharan sand. The persistent wind erased my efforts within a few seconds. My last form of communication was now exhausted. I looked past Antonio’s glasses into his confused but helpful looking eyes. Hoping he would telepathically absorb the message I was trying to convey. My limited Spanish was failing the task to convince Antonio we would be appreciative of a lift from Merzouga. First though we needed to make it out of the desert on a couple of camels. Allison and I had arrived in Morocco a week earlier keen to taste the unique culture of the bazaars, sample the tagine cooked cuisine and hopefully venture out into the dunes of the expansive Saharan desert. An agonising 9 hour bus ride had been taken from historic Fez in the north over the sizeable Atlas mountains. The kind of bus ride where you are first on the bus and last off. Where you imagine that a time-lapse video of the trip would show us as the only two people that appear constantly throughout. 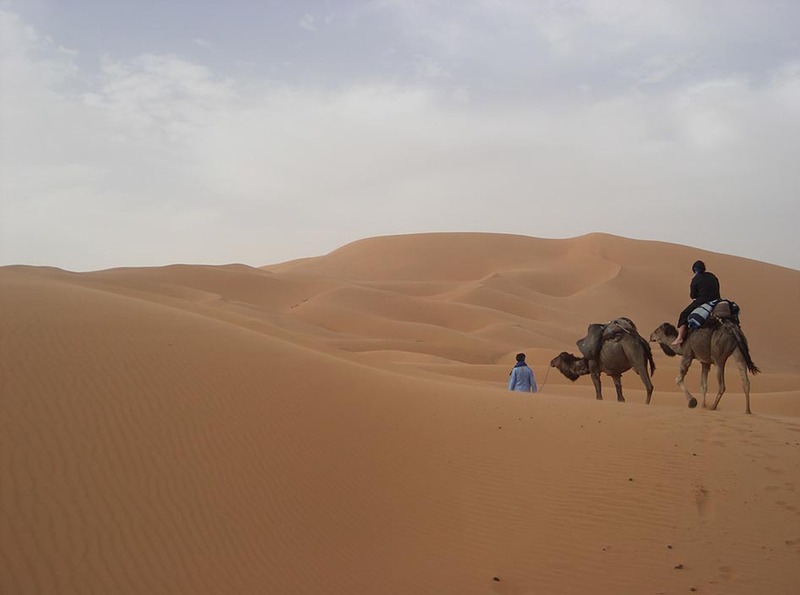 Our intended destination of Merzouga provides access to Erg Chebbi. One of two ‘Erg’s’ in Morocco. 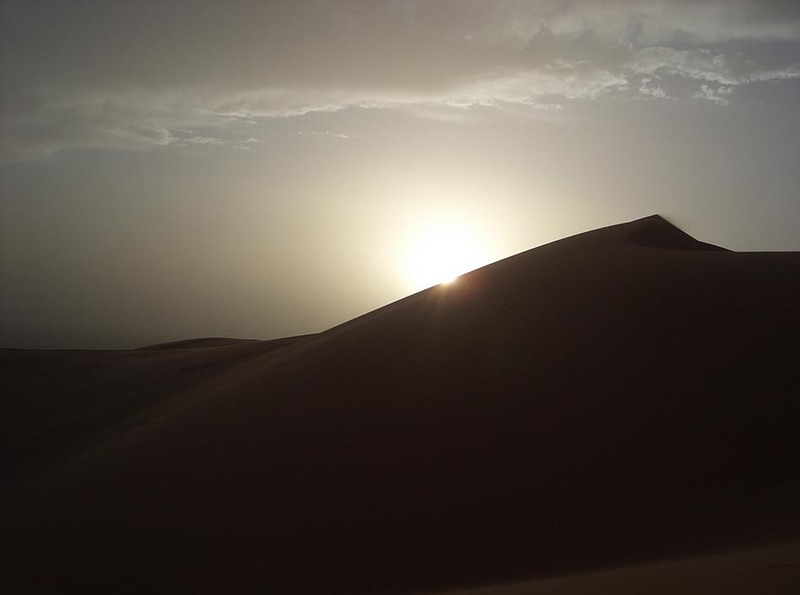 An Erg describes a significant sea of Saharan sand that is formed by the wind into dunes. These dunes draw the type of travellers not used to seeing sand that does not have waves crashing upon it. We’d heard trips into the desert were possible via camel and the ability to camp in a traditional nomadic berber tent. Sleeping under the stars, lost amid the endless dunes seemed like it was worth 9 hours on a crowded dilapidated bus. Arriving in Merzouga, the scenery matched the set of an apocalyptic Mad Max movie. An orange dust covered a few run down buildings. A deserted main street where gusts of wind caused mini sand filled tornadoes to twirl down the street. The main street continued dead straight through town and disappeared into the sand dunes which dominated the horizon. Erg Chebbi sand dunes are located on the border of Morocco and Algeria about 400km inland from the Moroccan coast within the Sahara desert. Contrary to popular belief the Saharan desert is not all sand dunes. Spanning an area the size of the United States, the Saharan desert has a varied terrain but large pockets of sand dunes like Erg Chebbi are dotted throughout. Fun facts about deserts were not top of mind as we stretched our legs hiking down the main street looking for a place to stay. We settled on Chez Julia run by a lovely Swiss lady and we dumped our bags and made it to the rooftop in time to watch the sun settle over the distant dunes. We were missing one thing to complete the picture. A soothing ice cold beer. Morocco being mostly a dry nation, beer is hard to come by. Occasionally a hotel owner will keep a few black market beers for thirsty travellers. This was not to be. An ice cold coca-cola was the more than suitable substitute. The next morning we enquired about the camping out in the desert. The only form of transport being the most conditioned of all desert going vehicles, the resourceful camel. With wide soft hoofs for walking in soft sand, to long eyelashes and sand proof nostrils to keep out the dust and the famous humps which do not contain water but instead fatty deposits. The conservation of water is what actually allows a camel to survive in such harsh desert climates more than any other large mammal. Our camels arrived right at the doorstep of Chez Julia, led by a guide Asis who was of Berber origin. Berber’s are the indigenous tribesmen who span across North Africa from Morocco to Egypt. Asis instructed the camels to kneel down to allow us to hop on the blankets lain over their back. Their cantilever legs tilted awkwardly forwards then backwards so we could hop on. Then repeated the same motion in reverse and we were soon loping down the main street! The sun was hot and dry on our skin and the turbulent wind consistently spun up waves of fine sandy dust. We had previously wrapped our heads in a long cloth-like turban. Doing our best to emulate Lawrence of Arabia, but despite the appearance it was a practical garment in the inhospitable desert. Soon we were on to the first dunes. The camels doing it with ease. Yet we were not. The constant sliding forward and backward on the rough matted blanket was soon rubbing me raw in a place you don’t want rubbing raw. Also my camel had a particular liking to the tail of Allison’s camel. Allison’s camel having a particular dislike for my camels interest in its tail. So it often spun around wildly to reprimand my camel that its tail was not on the menu. Both fearful of being tossed off into the sand and also having chafing in a delicate area, we both decided we would join Asis and walk alongside our camels through the desert. Walking barefoot seemed to work best. We walked for about 2 hours until the sand sucked all the moisture from our feet and we braved the camels once again. By now all signs of civilisation had disappeared and only endless dunes were visible. Completely disorientating as most dunes look the same. Only a few larger ones acting as landmarks. A short while later we arrived at the base of one of the larger dunes where a small camp was setup consisting of a handful of low pitched tents. To now we felt like we were the only people in this entire ‘Erg’. Although now a few other trains of camels had appeared over the dunes into camp. Atop one camel was a bearded man in glasses who we acknowledged with a nod as we alighted our camels into camp at the same time. This man introduced himself as Antonio and was from Spain. Our Spanish was as rusty as his English. We did uncover he had driven from the north of Spain across the straight of Gibraltar by ferry and continued driving south into Morocco in his ‘wagon’. Allison and I ascended the large dune near camp which was about 150m high. We walked along the ridge line and the sand dropped suddenly down each side. The wind sent a solid wisp of sand tailing off the peak of the dune. Once at the top we could see quite a distance yet still only see endless orange dunes stretched out below. We met Antonio again as we were heading back down and chatted briefly about the effort to reach the top. The sun was setting over the dunes just as we arrived back to camp. The sudden coolness of the desert resulting in an immediate chill as the sun disappeared. Camp now had 12 guests with about 4 berbers including Asis arranging camp and dinner. Tents consisted of thick blankets hung over a wooden frame with another thick set of blankets as a bed on the soft sand. Our trusty camels knelt in the sand and had one of their forelegs hobbled with a thin rope to prevent them walking off in the night. Camels need to be lead out into the desert but have a very strong sense of direction when returning home and can easily navigate the route on their own. The hobbling while it seemed a bit cruel was a long used technique in a place there are no trees. It also stops one being left stranded up Erg Chebbi without a camel! We had been split into groups of 4 for dining in the small mess tents and we were put with a Norwegian couple who were very easy to chat with. The berbers cooked up an amazing Tagine of lamb, salad and cous cous served in a large communal plate. We shared the delicious meal and talked till late in the evening. As we headed to camp a bright moon dominated the sky and gave a clear path back to the comfort of our tent. Morning came and as the sun rose Allison made a hurried exit from the tent to be violently sick. A bout of food poisoning the likely culprit. How myself and the Norwegians did not suffer the same fate remained a mystery. The day ahead looked bleak. With three hours through the hot desert on a camel our only way out of the sand dunes we also needed to be on the bus out of Merzouga as it didn’t run again for another three days another three days. Even then, our new found awareness of the Moroccan bus conditions did not make this a very appealing option anyway. Allison was sick again behind a small dune for the fifth time in an hour. Our brief conversation yesterday with Antonio and his ‘wagon’ offered a glimmer of hope of having a more comfortable ride. How to bring up with someone you barely know to ask for a lift to a place you’re not sure he’s heading to with linguistic skills that to date have only allowed for simple pleasantries? I approached Antonio as he was getting ready to board his camel. I asked about his wagon and where he was going. “I go Ouarzazate” he replied. The first piece of the puzzle fell in to place. This was where we were headed too. Next came my very gesture assisted request if we could get a lift. “It is OK” was his simple reply to what I hoped had come across correctly. Next was how on God’s good earth do we work out a suitable rendezvous point? 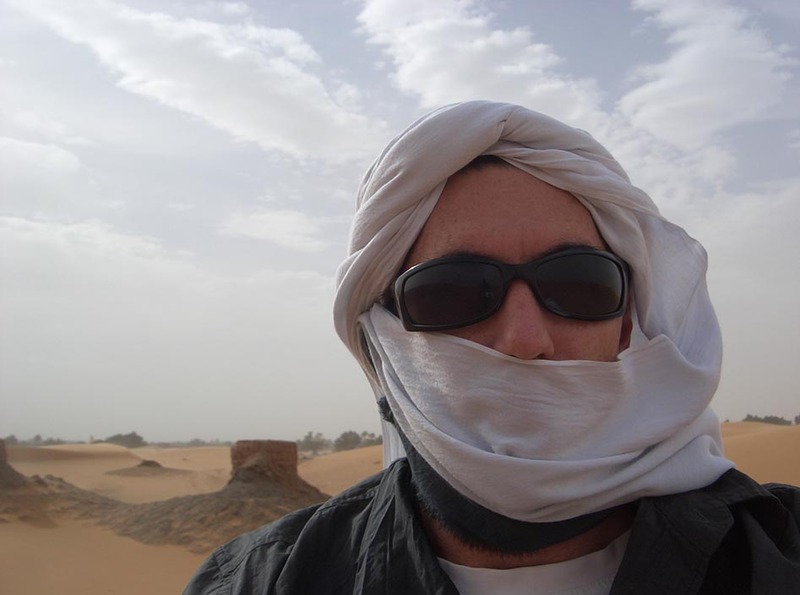 Antonio was staying in another town south of Merzouga. I told him our hotel name ‘Chez Julia’. Neither of us had a pen and paper. I wrote ‘Chez Julia’ in the sand and a vague map and repeated ‘Merzouga’. It would require Antonio to remember the hotel name and town after a three hour camel ride. Assuming after this he will bother to go to the trouble to pick up a couple of strangers in another town and ferry them around half of Morocco! Allison was super sick. The kind Berbers had applied some desert medicine including weird constrictive hugs. I dug out some pills to ease the nausea but all to no avail. The trip back was frequently interrupted with another bout of sickness. Myself and the berber guide kept a keen eye on the camels as if left unattended they naturally began their walk for home! Their slow loping stride deceivingly quick. If they got much of a head start they’d be gone! We arrive back to Chez Julia and owner Julia administers Allison some pills and flat lemonade to ease the pain and replenish sugar and fluids. Meanwhile, I waited out the front keeping an eye out for Antonio. Keeping an eye out for what I’m not sure. We didn’t discuss the characteristics or even colour of his ‘wagon’. Another hour passed and no sign of Antonio. I walked a few blocks into the main street of town eyeing any wagon like vehicle closely to see if I could see an Antonio like figure in the drivers seat. Another hour passed and I had made my way back to Chez Julia and then back out to the main road again. Really not wanting to spend 3 days in desolate Merzouga and really not able to afford a chauffeured Mercedes onwards I held out hope for Antonio. I sat on a stone railing watching trucks, cars and vans passing over a small bridge. I saw a van approach which I felt fit the description I had made in my mind. I saw two people in the front cabin and quickly dismissed it. As it got closer I saw the driver turn in my direction and wave. It was Antonio! He had been driving around trying to find us, unsure of the hotel name he’d done a few laps and in the process picked up another hitchhiker! We drove back to Chez Julia and I escorted Allison into the van. There were no seats in the back only Antonio’s mattress so Allison happily laid flat as we drove west and quickly fell asleep. We dropped Antonio’s other hitchhiker at a tea shop about half an hour away. I then hopped in front and made my best efforts to converse. Antonio named his wagon ‘Lola’ and had been on many travels together. This trip though was his biggest to date. We passed through a very open, dry and rocky landscape. The road dead straight hitting the horizon in the distance. Occasionally we’d see an oasis. Indicated by a small grouping of palm trees around a small depression in the ground. Late that afternoon we arrived into stunning Todra Gorge. A natural fault in the earth creating a 300m high gorge and a pristine water source emerging into pools along it’s route. We picked Hotel Yasmina to stay. An impressive building built of the local stone. Allison was feeling a lot better after sleeping. Still we laid low and occupied a sofa in the common area of the hotel until evening. The owners were all quite talented musicians and started playing a few songs as much for themselves as for the handful of guests. Antonio joined in playing the drums and singing along and they band played well into the night. Antonio sleeping in Lola out the front of the hotel. We concluded it was a rare day when you wake up ill in a tent in the Saharan desert, hitch a ride and end the day singing songs with the driver in a hotel made of stone! 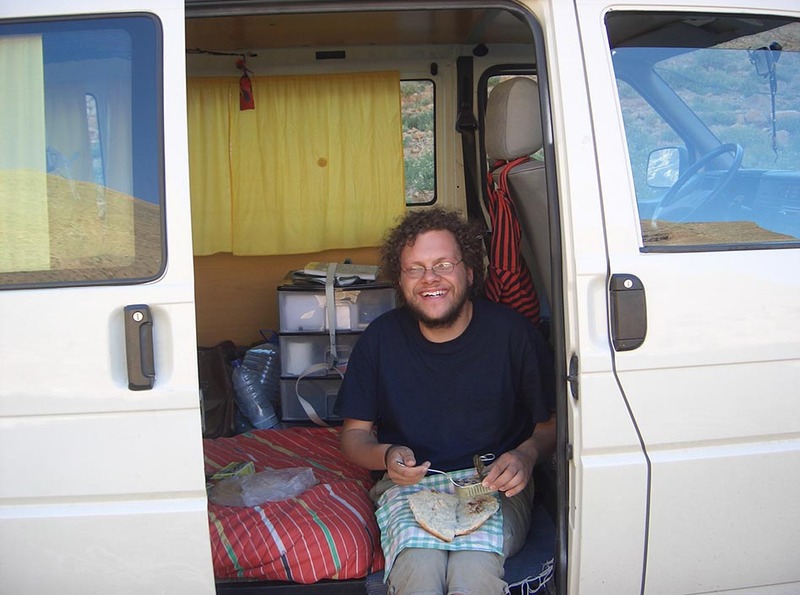 We were extremely thankful for Antonio’s generosity (and Lola’s) and he also drove us the next day to Ouarzazate. We offered money for fuel and he refused it, but we insisted. He saved our Moroccan trip! Many year’s later I saw a post from Antonio on Facebook. Lola had been sold. So I echo Antonio’s sentiments and thank Lola for taking us those few crucial days through the desert.